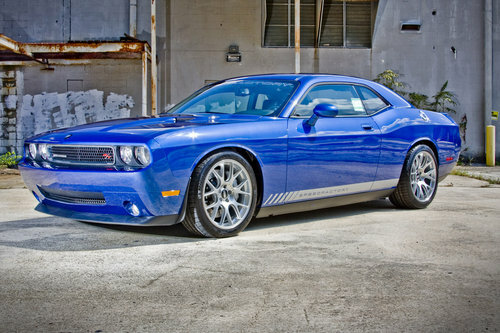 The SpeedFactory prepared 2010 Challenger R/T is powered by a 5.7 liter Hemi V8 engine with a Vortech centrifugal supercharger that increases the output of this reliable, modern Mopar power plant to well over 500HP. The SF500, running on premium-grade 91 octane pump fuel, has consistently produced 544 HP and 530 ft-lbs of Torque on independent dyno tests. SpeedFactory performance modifications include a heavy-duty Level II 5spd transmission (for automatic cars), Hotchkis performance springs & sway bars, front and rear strut tower braces, and Corsa Extreme stainless steel cat back exhaust system. SpeedFactory's Signature package for the SF500 includes custom floor mats, serialized number plate, badging and exterior graphics. SpeedFactory also offers their exclusive BBS CH-R wheel and Michelin Pilot Sport PS2 tire package. The SF500 comes with a full 3yr/36K mile Warranty and, at $46,900, is the most affordable high performance SpeedFactory car to date. It joins the complete line of SF600, SF600R and SF700R Dodge Challengers, Chargers and Chrysler 300's now offered by SpeedFactory Cars. I really love the color! The blower doesn't hurt.